‘Silence’ 沈默 opens in Taiwan – must go, must see! Harrowing, compelling, gruesome, powerful, emotional, brilliant ~ all these and more….. 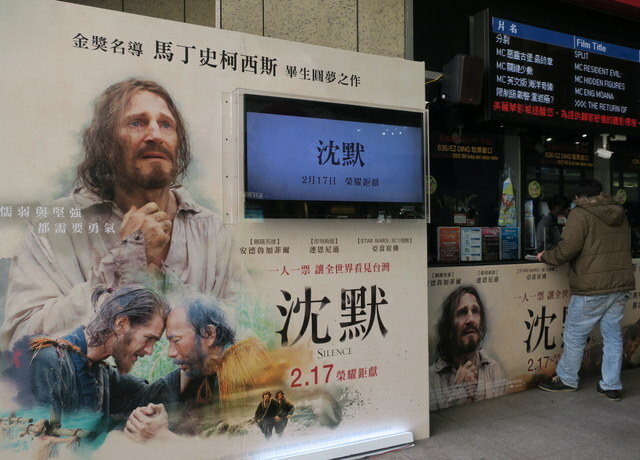 The movie ‘Silence’ 沈默 opened yesterday throughout Taiwan ~ definitely a Must-See ~ and all filmed in Taiwan, the scenery is superb – though recognizing familiar sites adds to the rawness and intensity of it all. And there’s plenty of inspiration and food for thought for everyone following the readings in preparation for this Sunday’s sermon on loving your enemies and praying for those who persecute you….. almost ironic that it should open this weekend in view of the sermon topic on Sunday. That’s why I’m off to St. James’ Church, Taichung…. The kind of movie (like the book) that you never forget – but also that takes months or even years to process – and come to terms with the story and the tragic events behind it. Previous PostOnly at Night ~ Sanzhi’s New Bridge!Next PostHappy Year of the Rooster ~ Taiwan’s Lantern Festival 2017 @ Yunlin!